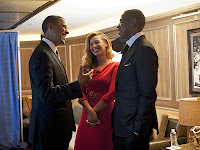 Showing the couple's support of Barack Obama with an intimate fundraising event at Jay-Z's 40/40 Club in Manhattan, PEOPLE's reigning World's Most Beautiful Woman introduced the President to the crowd of 100 who paid $40,000 a ticket. "I can't tell you how proud we are to host tonight’s event with President Obama," she said, The New York Times reports. "We believe in his vision." 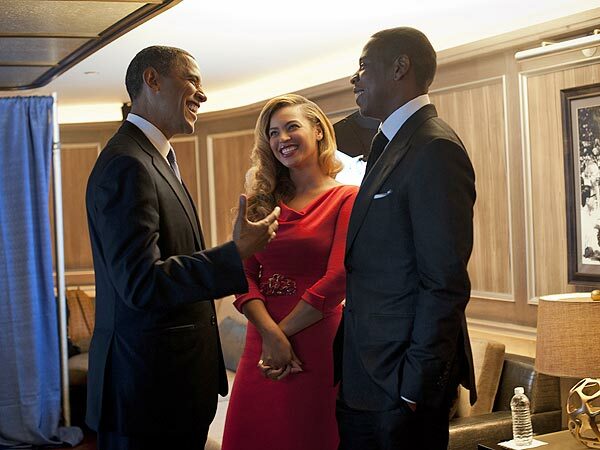 Once onstage, Obama said, "To Jay and Bey, thank you for your friendship." And while the President, currently running against Mitt Romney, concentrated on the issues of this campaign season – "The economy’s going to grow in a way that includes everybody," he said – the applause grew strongest when he compared Beyoncé's charisma to that of his wife, Michelle's. Keeping things personal, he also said, "Jay knows what my life is like. We both have daughters and our wives are more popular than we are." This wasn't the first time Beyoncé, a fan of Michelle Obama's, brushed shoulders with the Prez – she sang at his inauguration in 2009.